I smoked both Habano and Maduro cigars for this review, just to contrast and compare, both in the Toro size. Both cigars were very well made, though they shared a common flaw: a tight draw. The draw on the Habano was firm, but productive, while the Maduro was on the uncomfortably tight side for the first two inches and then opened up a bit. Both are nice looking smokes. I generally don’t care about band design, but the Padilla band exudes class. 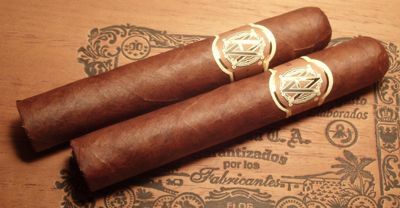 The Ecuadorian leaf on the Habano is a gorgeous milk-chocolate brown, smooth with a slight sheen. The Maduro is matte black with little variation in color. It’s a little bit rustic with its lumpy round head, but that’s the nature of maduro. Both cigars burned very well, especially the Habano. “Razor sharp burn” is a cliche to which I occasionally fall prey, but in the case of the Habano it was no hyperbole. Overall construction: Very good, with some slight hesitation about the draw. The Habano Reserva focuses on cedar and cocoa, while the Maduro tastes a little richer — think pine rather than cedar, combined with the dark chocolate flavors typical of San Andres maduro. A tannic dryness is apparent in both, a slight astringency that wanes as the cigar burns. The Habano is the more complex of the two — the aroma is sweet and spicy, assertive like a good perfume, but not overwhelming. The cedar gradually fades into the background as an earthy note takes over, accented by mint. The finish is lengthy and the aftertaste spicy. The Maduro starts out with a heavy, almost resinous pine which is slightly harsh on the tongue. It mellows out though as the pine turns to cedar with occasional spikes of bittersweet baker’s chocolate. It bangs this drum all the way to the end, making it somewhat one-dimensional, though still tasty. The aftertaste is tannic, with some black pepper toward the band. 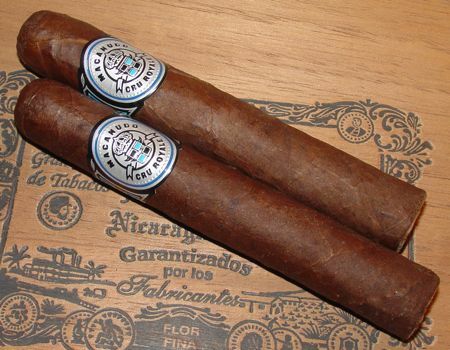 In both cases the smoke texture is medium in body, though the Maduro is a bit thicker, and both are about medium in strength. 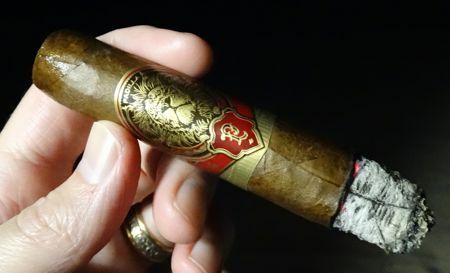 The Padilla Reserva is a top tier cigar in both the Habano and the Maduro incarnations, but the Habano is the more complex and interesting smoke. The Maduro is a decent cigar, but I might be just as happy with a musty old St. Luis Rey Serie G for half the price if those are the flavors I’m after. 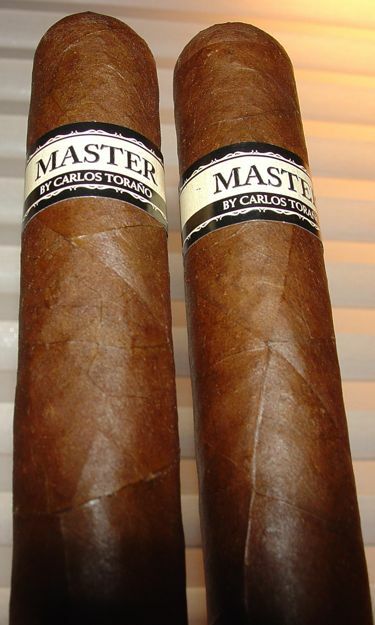 Both cigars ring in at around $8 USD for the toro size, but I would only be willing to pay that again for the Habano. Bear in mind that my assessment is based on one cigar only in each wrapper, and was perhaps skewed by the Habano’s utterly perfect construction. When the limited edition Avo Compañero was released in 2009, iconic spokesman Avo Uvezian declared it “the best blend ever released under my name from the Occidental Kelner Cigars factory in the Dominican Republic.” Avo lovers look forward to Uvezian’s annual limited edition releases, and the Companero seemed to garner more praise and excitement than many previous years’ entries. Most Avo cigars tend to be like Davidoff blends: milder, more subtle, and a little more “exclusive” than what is generally found in my humidor. But the Compañero stands out, with many calling it the strongest, if not the best Avo yet. 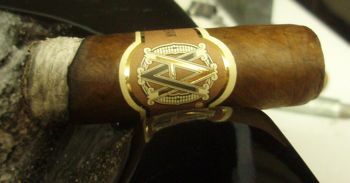 It’s safe to assume quality construction from this factory, and the Avo Heritage Robusto holds no surprises in that regard. 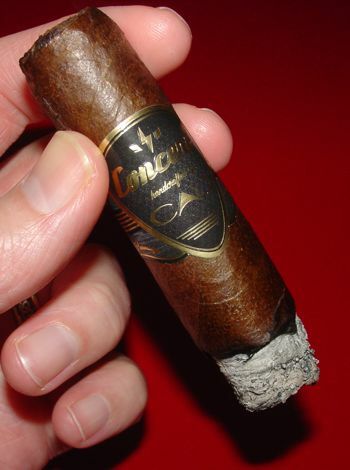 The wrapper is a dark and smooth colorado maduro with a touch of oil. The head is finished with a simple but elegant single cap. The roll is firm, the draw is effortless, and it burns with a slow and even disposition. A well made cigar draws no attention to its behavior. In that respect this one is practically invisible. 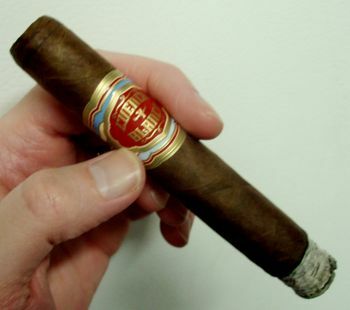 The Heritage robusto starts up with an herbal, grassy flavor overlaid with oak. There is a peppery aftertaste, and the finish is dry. A complex aroma with notes of vanilla, or even coconut, blends well with the earthier flavors on the palate. 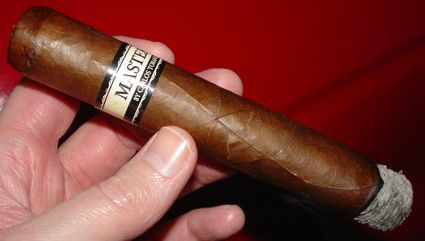 As the cigar develops it picks up some maduro-like flavors: chocolate notes pop up amidst the grassy, mustier flavors. From the ad copy I was expecting a heavier cigar, but I found it to be medium in body and only slightly punchier than the Domaine Avo. The last stage gives the pepper mill a few more cranks, but even with the spice and the char it remains balanced and smooth. Avo’s Heritage Robusto is a fine cigar, though a little too dry and grassy for me. It’s smooth, it offers a complex aroma, and is rather affordable, for an Avo anyway — MSRP ranges around $7.00 USD per cigar. The Heritage Robusto earned a nearly perfect construction score, and if you’re a fan of peppery Dominican cigars (and have exceptional taste) you’ll want to try this one. But given my dilatory posting habits, you probably already have. The CAO cigar brand has changed hands, moved headquarters, and reinvented itself, but the label’s new directors haven’t forgotten where CAO started: Music City, USA. The CAO Concert was blended by Rick Rodriguez as a tribute to Nashville, Tennessee, CAO’s original home town. The music theme of the Concert brand is apparent in almost every way: the box resembles a Marshall amp, the bands are designed to look like guitar picks from the front, the upper parts of a Fender Strat on the sides, and fretboards meeting in the back. (Wouldn’t a Telecaster have been better for Nashville?) The frontmarks are concert-related, and the cigar was even given a sneak preview release at the Country Music Association’s Music Festival last summer. I will make an attempt to restrain myself from abusing the music theme in this review. I will not not hammer on harmony or refer to the cigar’s opening act. I will not speak of overtures, or codas, or cadences. Not a note of it, I swear. The wrapper on the CAO Concert is dark, glossy, and almost veinless. Unfortunately, it is also very thin and prone to cracking. The head of the cigar is flat with wide shoulders. With a ring gauge of 54 this cigar is built like a fire plug. The draw ranged from easy to firm, and the burn was slow and even. It’s an attractive cigar until the wrapper starts to crack at the back. The humidity where I live hovers around 10-15%, so desert shock might be the culprit, though that’s rarely a problem with other cigars. Like all of my other cigars, I stored these at 65%, but maybe the Concert requires a more tropical residence. Overall construction very good, discounting for possible storage errors on my part. The Roadie is a bit wide for my taste, but the flavors are smooth and well balanced. The cigar opens with cedar sweetness and a dusting of cayenne which quickly dissipates, leaving a medium-bodied base of coffee and some soft baking spices — cinnamon, mild clove, or maybe even sandalwood. Conscientious and critical cigar smokers rarely get excited about medium-bodied cigars, but this is one that I would urge everyone to try. I was surprised at the complexity of this new CAO blend, and with its smooth demeanor and suave appearance, I highly recommend it. The Roadie is good for almost 90 minutes of tasty smoking, for which the $6.00 entry fee is a pittance. I hope that the wrapper cracking was an environmental issue that won’t occur to many other smokers, because in every other respect it performed beautifully. The only thing that I would like to see changed is the design of the band. The little Stratocaster tips are easily bent and quickly become annoying. Maybe they’ll take up my suggestion and change it to a Telecaster, so there will be only one tip to tear off. Aside from that small complaint, this is a wang dang doodle of a cigar. 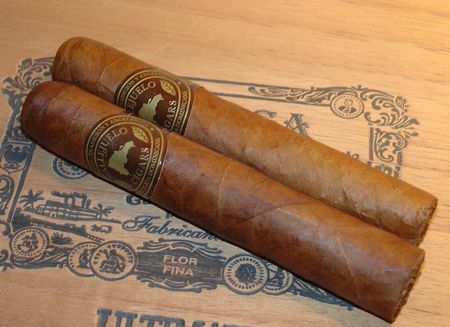 Vallejuelo is best known for its nomination as one of Cigar Aficionado’s Best Bargain cigars of 2010. The Robusto Gordo scored 93 points, along with CAO’s La Traviata Divino and La Aroma de Cuba Robusto. I do not subscribe wholeheartedly to CA’s opinion, but I respect it like any other opinion, and I’m always interested in a bargain. So I began my quest for Vallejuelo. So I searched and searched in my local shops, made inquiries, but finally came up empty handed. Eventually I got distracted by other developments in the cigar world and the brand fell off my horizon. A few weeks ago I was reminded by a reader about the Vallejuelo brand and while placing an order for some other things saw that Atlantic Cigar now carries them. They’re not expensive, and they fit in my shopping basket nicely. Vallejuelo is made by Intercigar, a Dominican company established by Dutch cigar impresario Maurice Antonius Koks. Intercigar also makes a budget brand called Antonius, and judging from their website they also make private label cigars for independent retailers. Vallejuelo was originally designed for the Swiss market as a less expensive alternative to Cuban cigars. They are certainly less expensive. In other respects it’s setting the bar very high, but we’ll just have to see if they stand up to the Behike. The name “Vallejuelo” means small valley. Take the band off a Vallejuelo robusto and it might be confused for half a dozen other high-quality smokes featuring triple-wrapped heads. The wrapper is a dark golden brown with a nice sheen. Pressing the cigar reveals a hard pack with almost no give, but the draw is open and the cigar burns at a leisurely pace. The ash is slightly flaky, but it holds. This is a very much a Nicaraguan style cigar. It opens with a brash dose of black pepper and then mellows into an earthy, but somewhat sharp smoke. After the initial spice of the Vallejuelo wears away, the mid-section slides into a potent mixture of earth and wood. The wrapper adds a note of cocoa and a touch of sweetness to the mix. The finale of the cigar is a return to the first third as the pepper makes a brief comeback and the smoke gets down and dirty. I’d classify this cigar as medium in body but full in strength. It’s one of those cigars that throws me back in my chair like the guy in that old Maxell ad. Just sub in a lawn chair and put him in the back yard. Vallejuelo is a tasty Nicaraguan-style cigar with a good thump. The robusto is a strong and earthy smoke with a subtle aroma, and that’s not easy to find in this price range. Its only flaw is some harshness that might fade a bit with age. Is Vallejuelo a reasonable alternative to Cuban cigars? Not exactly. But at $4.00 a stick it’s a less expensive alternative to many of the high-end cigars coming out of Nicaragua these days. I’ll be looking for this one in a couple other sizes to see if I can get the same flavor at a slightly lower voltage level. 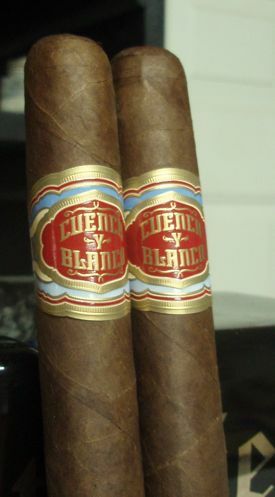 As much as I appreciate the creativity and craftsmanship that go into small “boutique” blended cigars, I can only imagine what blenders in small-time chinchales would do with the tobacco that General Cigar has at its disposal. The huge libraries of leaf that large cigar manufacturers have available for blending not only gives blenders the opportunity to work with a wide-ranging palette of flavors, it also allows them to blend cigars that are consistent from year to year. While a veteran cigar smoker at his wife’s brother’s bachelor party is probably going to re-gift that present of a Macanudo, at least he knows that this year’s Mac is not going to be any different from last year’s Mac. And that can be a very good thing, if last’s years Macanudo is what you’re game for. But General has started to take the fun out of ribbing the Macanudo brand. The 1997 Vintage Maduro had crusty old ligero junkies taking a second look at the band, and the Macanudo Cru Royale seems to be doing the same. 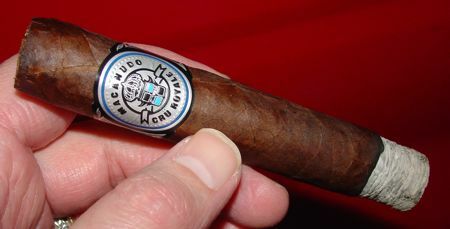 Benji Menendez and Francisco Rodriguez have chosen an Ecuadorian Habano wrapper for the Macanudo Cru, along with a binder from General’s Vega Especial in the Dominican Republic. (This is the same binder used on the Partagas Black.) The filler blend is a combination of viso leaves from the Dominican and Nicaragua, bolstered by some Brazilian mata fina. 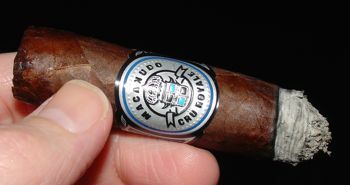 The Macanudo Cru Royale could easily be mistaken for a maduro cigar. Not only is the wrapper leaf dark enough, it’s also rough enough to pass for Connecticut broadleaf. 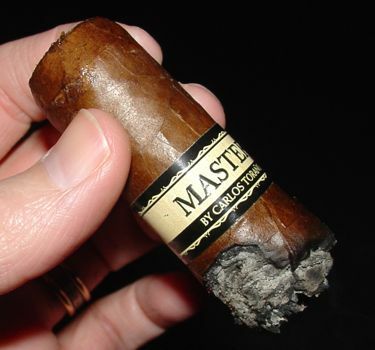 The head of the cigar is rounded, in typical Macanudo fashion, but the leaf is so thick that it looks more like the tip of a blackened sausage than the mild-mannered Macanudo we know and (sometimes) love. This leaf has clearly been chosen for reasons beyond the aesthetic. But who needs looks with a personality like this? The roll is solid, the draw spot-on, and it burns without a second thought. Even the ash is attractive. What’s not to love? 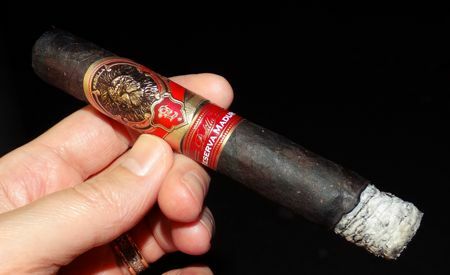 The Cru Royale looks like a maduro, and it smokes like one too. The soft aroma of sweet chocolate wafts up from the foot of the cigar almost before it is lit. The flavors on the palate are somewhat dry, and surprisingly spicy — not Nicaraguan puro spicy, but certainly spicier than what you’d expect from a Macanudo. After an inch or two the sweet savor of the chocolate turns noticeably sharper and more complex than the standard maduro. There is a note of hardwood and a mild acidic bite. The coffee and cocoa bean flavors slowly turn to coffee at the cigar’s conclusion, and it finishes with some pepper on the tongue. Not enough to be called rough, but it’s not exactly creamy either. The Macanudo Cru Royale is surprisingly aggressive for a Macanudo, but it stays well within the medium-body range and won’t challenge most delicate palates. Rookies graduating to medium-bodied cigars will enjoy the complexity of this smoke, and it won’t knock ’em out. I want to compare this cigar to the Macanudo Maduro Vintage 1997, but I’m not sure that is fair. The Cru Royale is considerably less expensive — in the 5 to 6 USD range — and is more of a standard line cigar. But they both came out at around the same time, so I can’t help myself. Not surprisingly, the Cru Royale is not as rich or complex as the Vintage ’97. But it’s still a very interesting cigar, especially for a Mac.